This truly is the simplest of recipes. It makes the most of summer’s greatest gift, the humble peach. So much more than the sum of its parts, it’s a beautifully delicate, juicy and satisfying pudding. Perfect for summer nights, dinner parties or just an afternoon treat. Gah, just look at that sticky sweet goodness! Though in fact it’s pretty virtuous, no added sugar, low carb, no gluten, vegetarian and can easily be made vegan. The perfect treat for those who want a little spoiling after supper but don’t want to spoil their waistline! The recipe is very similar to my Honey Roast Peaches, but no need to warm up the oven this time. *Substitute coconut oil for the butter and coconut yogurt for the cream if cooking for vegans. 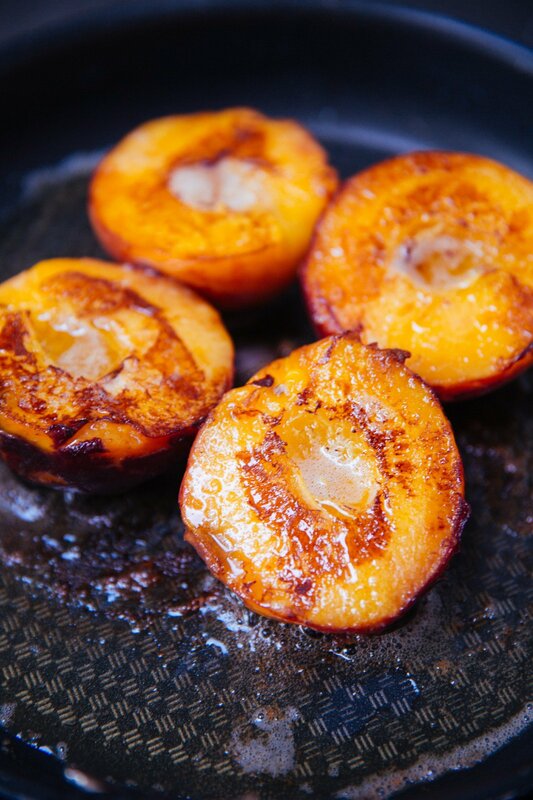 Pop a non-stick frying pan (I use this one) onto a medium heat and slice your peaches in half. Remove the stones and place into the pan, dry. Allow these to get a nice caramelized bottom and cook away for about a minute, before adding your butter. Fry in the butter (gently, so nothing burns) for 2-3mins. In the meantime you can crush your nuts. Once your peaches have softened, gently turn them over. Fry on this side for the same amount of time, feel free to spoon over some of the bubbling sauce. When they’re nice and soft all the way through, pop them out into their serving bowls. Toss your nuts into the pan and coat with the peachy buttery sauce. Sprinkle over your peaches, top with the cool cream and you’re done! Tuck in and feel those peaches melt under the spoon, their juices mixing with the rich cream. The nuts add the most exceptional crunch and change of texture. I know you’ve seen me make it on Snapchat a hundred times, so let me know how you get on with it in your own kitchen! I’m sure it’ll be just peachy. Ps. I bought my peaches from a little farm shop, which is why they’re quite so huge! I thoroughly recommend doing the same, with a dish this simple – the better the ingredients, the better the result.